Attendance: You are expected to attend 75% of all troop meetings, Patrol Leaders’ Council meetings, outings, and service projects. If your attendance is low, or if you have three (3) unexcused absences in a row, you can be removed from office. Attendance: Set the example by being an active Scout. Be on time for meetings and activities. You must call the Senior Patrol Leader or Scoutmaster if you are not going to be at a meeting or if you suddenly have to miss an outing. You also need to make sure that the “someone” is ready to assume your responsibilities. This may not be an actual performance, perhaps a taped recording if for a formal event. This requires you to “Be Prepared”, plan ahead and this will never be an issue. Plays bugle as requested by troop leadership, such as Troop assembly at meetings and campouts. 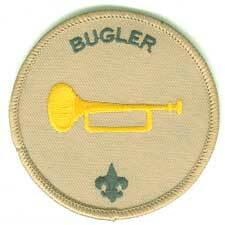 Should work on completing Bugling Merit Badge by end of term.